As the “farmer” has worked hard to “prepare the soil, sow seed and water” the planter has gathered a core, won some folks to Christ and they are meeting in groups to form community before there is ever a worship service. He has defined his strategy and can articulate it clearly throughout his team, has organized his systems, recruited and trained his teams, identified his meeting place and all systems are go. He is no longer on pastoral staff at HCBC, as he transitions his employment status to his new church plant. At this time, benefits are available to all AHCC church plants, and typically our churches utilize Churchbizsupport.com for financial reports, filing tax documents with the state, and payroll. The aim is for the resident to launch a spiritually vibrant AHCC church plant that will eventually mature into a church planting church, sitting at the table with partners in a movement. A robust coaching system is in place. Staffed by former HCBC elders, coaching is designed to encourage, support, and assist you in executing your ministry plan. After launch, you will meet bi-monthly with the Director of Church Planting for the first few months and monthly with your coach until you move from church plant to “Church” status. The expectation is that within four years you will have achieved the Five Benchmarks of a Self-sustaining, self-governing Church Planting Church. Principles and practices of the church (some call it a constitution) are in place on a provisional basis. The church plant operates in an autonomous way to gain a feel for autonomy. However, the elders of the planting church can set aside the principles and practices in the event of mitigating circumstances that require, in the judgment of the planting church, intervention. Resources are made available but in such a way that it does not create dependency on something other than God. Annual Church Budget and Annual Ministry Plan, broken down month-to-month, is presented for approval of Church Plant Team. Elder candidates are presented for approval of Church Plant Team. Criteria for performance: “Seven Characteristics of the Missional Church” as the winning behaviors and the Five Benchmarks for progress toward becoming a Self-sustaining Planting Church. The CPTC has established an aggressive strategy for achieving sister status in the association for a number of reasons. First of all, the larger goal is for our churches to become prevailing, sustainable ministries in the city for the long haul. Secondly, for a church to become a multiplying church, it must hit the critical mass to sustain the initial “losses” of multiplying itself. Thirdly, conventional wisdom says that the growth patterns in the early years in the life of a church set its trajectory. Hence whatever happens in the first 3-4 years will generally determine what it will grow up to be. Finally, the sizable financial investment made in Hill Country Association churches assumes that we engage a high capacity leader who will develop a high capacity leadership team that will establish an aggressively gospel centered church committed to reducing the lostness in its geography. There are many other indicators of church health, but we have benchmarked five non-negotiables that demonstrate the church will be around in twenty years, and has the likelihood of being a church planting church in its own right. Malcolm Gladwell defines a sociological phenomenon he calls a tipping point that occurs when a movement becomes viral. We believe a church can become viral when it reaches a “tipping point” of well-aligned gospel centered people that can independently support its mission with both financial and people resources. At 200—either in worship attendance or weekly involvement in missional communities, a church possesses the critical mass to sustain significant losses without devastating consequences. Growing the elder board is a reflection of three significant developments. First, the church has demonstrated a commitment to honor the critical office of the elder; second, the church has demonstrated the capacity to raise up disciple making leaders, and third, the church is growing a leadership culture that ensures the ongoing spiritual leadership of the congregation. According to Stetzer’s research on Church Plant Survivability, a church increases its odds of surviving by 250% when it has intentional leadership development training. With the addition of staff the church’s leadership has demonstrated the capacity to embrace the sociological realities of the multiple staff required of a larger, more complex community. Another indicator of having created a leadership culture, the added staff of equippers further augments the survivability case. Giving demonstrates two crucial indicators: First, a giving church is a financially free church capable of living within its means. Second, it is a reflection of a true commitment to mission, the first indicator of a core value for living out the reality of becoming a church planting church. We have first year church plants who have partnered in the planting of a church although they had less than a hundred in their church. The five year plan reflects intentionality about the commitment to reaching every man, woman and child in greater Austin, and an understanding that no single church, however vibrant or growing it may be, can reach the city by itself. Our city needs hundreds of gospel centered churches in order to see its vision become a reality, and without intentional plans, the vision is nothing more than a pipe dream. Table 2.1 makes note of the annual benchmarks a church plant pastor and team must reach in order to obtain sister status within 3-4 years. This is an aggressive growth rate expectation. We hope that most of our churches can obtain these goals within a four-year period. It is helpful for our coaches and church planters to see these goals in detail so that they can intentionally set their own benchmarks that fit their context. Each goal within a ministry area relates to the greater goal of reaching “church” status. Growing from Church Plant to Church is synonymous with becoming a healthy, growing, sustainable church. 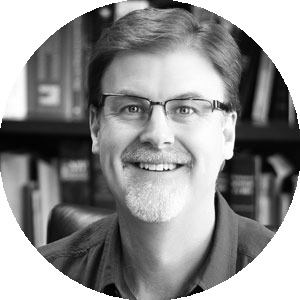 In 2004, Dr. Bill Day conducted a fascinating study of plateauing churches in the United States. As he fine-tuned the data of this five-year study he came to a shocking conclusion. Of the 13,000 churches that were considered “growing,” 1,400 of them had not baptized one person. Some churches that were considered growing needed 1,400 members to baptize one member. By adding the criterion that 25% of the growth had to be conversion growth only 11 percent of the 13,000 churches surveyed could be considered a healthy growing church. 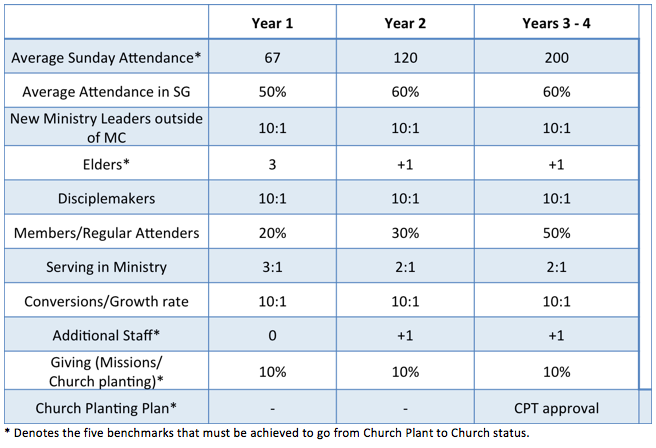 This study illustrates the need for Hill Country Church Plants to clearly define the win in terms of reducing lostness, not adding attendees. 3) When a Church Plant achieves Church status, they are a voting member in the Association and become fully autonomous. Malcolm Gladwell, The Tipping Point, Back Bay Books, 2002, pp. 9-13. “Proposed New Definitions for Growing, Plateaued, and Declining Churches in the SBC”, a presentation at the annual meeting of the Southern Baptist Research Fellowship in Atlanta, GA, September 23, 2004, by Bill Day Ph.D., NOBTS.